This page is about the Japanese medium tank M4A3 (76) W (Japan). For similar vehicles, see M4A3 (76) W and M4A3 (105). The Medium Tank M4A3 (76) W HVSS Sherman (or just ▅M4A3 (76) W) is a Rank III Japanese medium tank with a battle rating of 5.3 (AB/RB/SB). It was introduced along with the initial Japanese Ground Forces tree in Update 1.65 "Way of the Samurai". This Japanese vehicle, following the M24 SDF in the tree line, is identical to the American M4A3 (76) W HVSS Sherman. 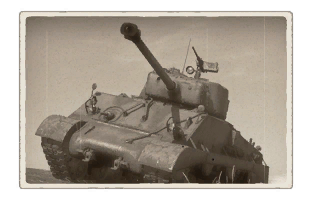 Playing as the M4A3 can be tricky since it features armour that can't stop most calibers at its rank such as the German 8.8 cm or the Soviet 85 mm, including the fact that it isn't the fastest tank. 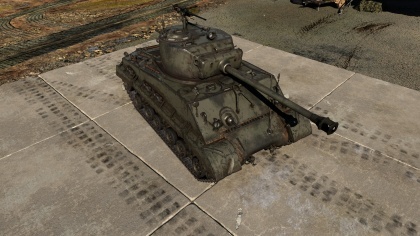 The M4A3 plays more of a support role, use the powerful 76 mm to assist teammates during an advance or defense. 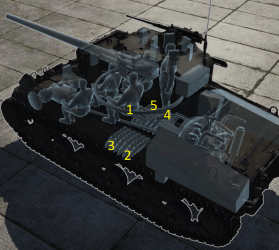 The number one rule of this tank is to never fight alone with it, always be with a teammate and use cover when available since it will give the Sherman a great advantage. In July 1st, 1954, Japan set up its post-war military force, the Japan Self-Defense Forces with the purpose of defending Japan should it come under conflict in the ongoing Cold War between America and the Soviet Union. To jump start the remilitarization, America gave the newly formed JSDF 254 M4A3E8 Shermans. The Shermans remained in use in the JSDF until the new, domestic tank design Type 61 was made in large numbers during the 1960s. ↑ Priory_of_Sion. "Sherman Use Around The World." The Sherman Tank Site. WordPress, 23 Nov. 2015. Web. 16 Dec. 2016. <http://www.theshermantank.com/tag/post-war/>.